Currently, Offshore Wind Farms (OWFs) are designed to achieve high turbine density so as to reduce costs. However, due to wake interferences, densely packing turbines reduces energy production. Having insight into optimized trade-offs between energy production, capital investment and operational costs would be valuable to OWFs designers. To obtain this insight, the design of OWFs should be formulated as a multi-objective optimization problem. 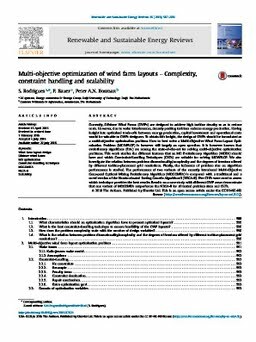 How to best solve a Multi-Objective Wind Farm Layout Optimization Problem (MOWFLOP) is however still largely an open question. It is however known that evolutionary algorithms (EAs) are among the state-of-the-art for solving multi-objective optimization problems. This work studies the different features that an MO Evolutionary Algorithm (MOEA) should have and which Constraint-Handling Techniques (CHTs) are suitable for solving MOWFLOP. We also investigate the relation between problem dimensionality/complexity and the degrees of freedom offered by different turbine-placement grid resolutions. Finally, the influence of problem size on algorithm performance is studied. The performance of two variants of the recently introduced Multi-Objective Gene-pool Optimal Mixing Evolutionary Algorithm (MOGOMEA) is compared with a traditional and a novel version of the Nondominated Sorting Genetic Algorithm II (NSGA-II). Five CHTs were used to assess which technique provides the best results. Results on a case study with different OWF areas demonstrate that one variant of MOGOMEA outperforms the NSGA-II for all tested problem sizes and CHTs.